I’ve got a new home improvement product that I’m excited to share with everyone! I chanced upon the Alice Blue candle kiosk at Rockwell on a liesurely window shopping stroll. Their Tiffany Blue motif and yummy fragrance easily attracted me. Upon closer inspection, I discovered that these candles were locally manufactured, hand-poured and made of soy — vegetable wax, which is both biodegradable and renewable. Evidently, vegetable wax candles burn longer. And if they’re coming from a renewable source, even better! I spent about 20 minutes just sniffing around, deliberating which scent I wanted my dressing and bath rooms to smell like. Not a fan or sweet florals or fruits; I tend to gravitate towards clean, simple, fresh, “white”-smelling (sampaguita, ylang-ylang) scents, so I settled with a delicious White Tea & Ginger variety. SOLD. Two in my eco-bag, please! Alice Blue is located at Rockwell Power Plant Mall, Makati. 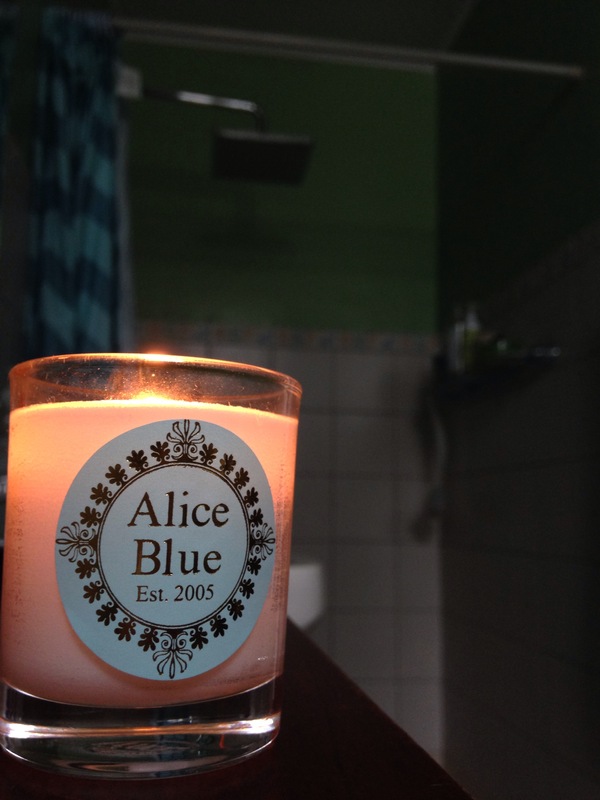 For more information, visit alicebluecandle.com or e-mail inquiry@alicebluecandle.com. This entry was posted in #LifestyleChange, Words and tagged #lifestylechange, Alice Blue, environment, home. Bookmark the permalink.